OCEANS ENTERPRISES - HISTORY OF DIVING - UNDERWATER BOOKS, DIVING BOOKS. For a comprehensive listing of historic and classic diving books, many of which cover the history of diving, see the sponsored site CLASSIC DIVE BOOKS. This is a very interesting book as it took me back to the days of rubberised ‘life-saving' vests (I never had a Fenzy), the old J-valves on the steel 72s, and long-johns. I never went back as far a twin-hose regs, but I did once use a snorkel with a ping-pong ball! But the book is more than a trip down memory lane. I shows the development of scuba gear up to present times - but not into the mdoern technical equipment that is becoming quite popular. The book is also most useful in giving the reader a better idea of how equipment works. A very interesting book. 60 pages, 8-1/2x5-3/8, saddle stitched, tables. ANOTHER WHITSTABLE TRADE Subtitle: An Illustrated History of Helmet Diving. This book, "Another Whitstable Trade", has been initially published with a numbered run of 750 copies but I am sure re-prints will soon follow. This is the result of around 30 years work and research and "does it show"! 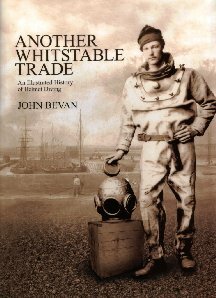 It tells the history of the spread of the diving industry from the small group of divers in Whitstable in the UK in the early 1800's to the rest of the UK and ultimately the rest of the world. Everything is so well documented and illustrated with contemporary photographs and diagrams, countless numbers of them (well worth having just for all the unseen pictures). This wonderful book is divided into six sections and again sub-divided within each section: 1 The Whitstable Connection. 2 Major Organisations. 3 Civil Engineering Applications. 4 Diving Equipment Manufacturers. 5 Selected Notable Divers. 6 Physiology and Medicine. At the back, there are 11 appendixes that again expand on various subjects including the "Dean Diving Manual" and a list of Sir Robert Davis's patents. It is a truly wonderful record of diving history and is well worth having while copies are still available from the author at www.submex.co.uk where you will see his other books including "The Infernal Diver" and "The Professional Divers Handbook". Standard Dress Sport Diving. "A Practical Guide to Sport Dive the Classic Standard Dress Diving Helmet". This very informative book came about because of the interest of recreational scuba divers (and indeed non divers) in the use of the traditional old "hard-hat" equipment used exclusively before the advent of on-demand scuba and surface supplied hookah diving. It is only recently that the fascinating use of this early design diving apparatus by recreational divers gives an added perspective of their enjoyment underwater. The physics may be the same as scuba but the operation and enjoyment is a new experience that is growing to such an extent that many divers are now buying old equipment and fully restoring it for recreational use, or even buying new equipment which, perhaps surprisingly is still available. Of particular interest is the fact that in 2009 and 2010, a recreational standard dress course has been conducted in Portland, Victoria, by Professional Diving Services with the endoursement of the international NAUI organisation. 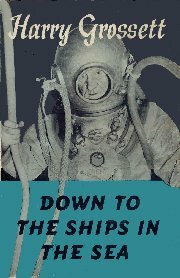 This excellent book gives a very useful background for anyone interested in standard dress diving, both from an historic and a practical persepective. It describes in some detail some of the ‘hardhat helmets' that are currently used recreationally, and the accompanying accessories such as the dress, boots, weights etc, describing the equipment terminology and its fundamental use. The new skills required, predominantly to do with air control and buoyancy, are described in some detail, and of course maintenance of equipment and diver safety is emphasised throughout. The author recently dived in the Melbourne Aquarium in his own standard dress and allows a page to describe the experience - something that the public will see more frequently over the years I am sure. A delightful book even if you don;t have ambitions to give it a try. Maybe this concise book will chance your mind! .A5 size, saddle stiched (stapled), 44 pages, well illusatrated with many mono photographs, resources list. $15.00 Sorry, no longer available. Harry Grossett. First published 1953 by Hutchinsons & Co. (Publishers) Ltd, London. Hardcover, dustjacket, 256 pages, many mono photographs. The author is no doubt one of the great hard-hat divers of the last century, travelling the work salvaging the mindane and the exotic, from all sunken cargo ships, to gold and othr treasures; he covered both world wars, and was a principle diver in the raising of the German fleet at Scapa Flow. Although much of the book is biographical, he also reveals the principles and practice of standard dress diving, and how it has developed over his half century of working. A superb book, one that you can't put down, and because of its content, of historical value. From the fly: Harry Grossett is probably the most experienced deep-sea diver in the world. He has been going down to the ships in the sea for half a century, and next year he will celebrate both his seventieth birthday and the fiftieth anniversary of his first dive. During his career he has been at the bottom of most of the Seven Seas. He has had to break the ice to go down, and he has walked in the beautiful submarine gardens of the shark- infested tropics. He has traveled all over the world to salvage gold and other cargoes and to render first aid to ships. He has been bitten by a conger eel, trapped in a sunken troopship, and buried under concrete. He has sawn off human limbs under water, and salvaged human bones, and twice he was nearly murdered under water at Hong Kong. During the First World War he was diving from a war-ship off the Dardanelles, and in the Second World War he was senior diver on the laying of the Accra Pipeline. Between the wars he played a leading part in the biggest salvage operation in history - raising the German Fleet at Scapa Flow. He is still diving today. This book is full of adventures, but it is more than a personal adventure story. The author reveals the principles and practice of deep-sea diving, and shows how it has developed during the last fifty years. He looks forward as well as back, and discusses how modern inventions like armoured diving dress and television may affect diving; and in a thoughtful analysis of submarine disasters he suggests how loss of life might have been prevented in the past, and how, by a change in Admiralty policy, it could be prevented in the future. The original edition was published in 1940 and is now rare and very much in demand. This 2009 edition is an excellent reproduction. Now due to modern on-demand printing techniuques, classic dive books can be reprinted and released, providing copyright conditions are met. Some reproductions leave a bit to be desired, but I am pleased to say that Up For Air has been very well reproduced, with the eleven illustrations. It is also available in the USA in softcover but I have only brought in the hardcover as I believe that a book of this interest should not be compromised. Frank Meier wrote several books, but Up For Air appears to have been the most popular. If you are interested in the ‘old' method of standard dress diving, this is a must. From the preface of the original 1940 edition: The story you are about to read is a recital of my work for thirty-five years as a diver, on many types of assignments and in many kinds of circumstances and conditions. You will learn what I did; why, how, and for whom I did it. You will lean about others, associated with me in this fascinating profession, and some of their experiences. In giving you this account, in this way, I sincerely hope that I shall have painted a picture which will not only prove entertaining and instructive in itself, but will serve to offset the all too many inaccuracies and false impressions created by some whose experience is insufficient, or whose imaginations exceed their knowledge of the subject. $56 Sorry, no longer available from us. Google name, may be available in the USA. On the Bottom with the Northwest Salvage Divers. Provides an historical view of the Atmospheric Diving System with a description of the mechanics involved in placing humans and machines under water and under great pressure. Written by a commercial diver who is a technical mechanic, the book addresses the need for intelligent understanding of the machine's operations and the required capability to assess the risks that may be encountered. Chapters include: The Story of the Atmospheric Diving Suit; Beginning of A.D.S. ; Understanding the Pressure of Sea Water; The Birth of Understanding the Effects of High Pressure and Decompression; John Scott Haldane; the S.S. Egypt; The Benjamin Leavitt Story; Early Life Support; The Decades of Stagnation; The Advent of Mixed-Gas Diving; The Post-War Years; The Decade of Discovery; The Technical Rebirth of A.D.S.. Bibliography . Paperback, 119 pages, mono photos, drawings and charts. $24.00 Sorry, no longer available from us. 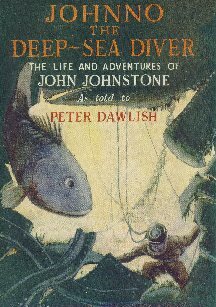 JOHNNO THE DEEP SEA DIVER The Life and Adventures of John Johnstone. As told to Peter Dawlish. Published by George G. Harrap & Co., London, Sydney etc. 1960. Published hard back with dust jacket; 245 printed pages. Dimensions: 22 cms tall by 14 cms wide . Second-hand copy on offer is ex-library in very good condition, only one small library stamp on inside facing page. Reprint 1961. No original dust-jacket - comes with computer generated facsimile cover in library protective plastic. Looks like new. The title sounds like a kid's tale - but I don’t think it is meant to be. He was one of Australia’s top commercial divers, in standard dress of course, and in solid diving bells, as per his work on the Niagara in New Zealand. THE "PORPOISE" - Australian Diving Technology the World Copied. Des Walters, Des Williams, Melven Brown and Tony Gregory. Note: Sadly, Ted Eldred died in 2005 and did not see the book to which he contributed so generously. The Historic Diving Society has created the Ted Eldred Award to be presented to a member of the organisation who meets specific criteria regarding their contribution to the presentation and preservation of our diving history. Sorry, no more copies available. THE HISTORY OF UNDERWATER PHOTOGRAPHY AND CINEMATOGRAPHY IN ITALY. Storia della Fotografia e Cinematografia Subacquea Italiana. We know of the French contribution to recreational diving - Cousteau made sure of that - but few of us have bothered to appreciate the contribution of the Italians, especially in underwater photography and cinematography. They have been at it since 1932, with weird and bulky homemade and later commercial equipment housing the Rolleimarin and Praktiflex, and the Elmo cinecamera. Names such as Raimondo Bucher, Roberto Rossellini, Victor de Sanctis and the author himself are not familiar to us, but they should be for their contribution to the development of underwater photography. And where did the Nikonos system originate? We are however familiar, or should be if we have an interest in the history of diving, with Folco Quilici, Fosco Maraini, Bruno Vailati, Dimitri Rebikoff, and Louis Boutan, all significant players in the development of underwater photographer. The book takes a chronological look at this development, from 1932 to 1989, the latter years mentioning contributions from Hass and Cousteau as well as our Aussies Cropp and Taylor. The diving gear is an interest in itself, whereas the photographic equipment seems to have stabilised in development after a decade or so, its use divided between housings and the self-contained Nikonos system. A very interesting book and a great contribution by Alberto Romeo to the historical record of diving. By the way, has anyone got a copy of the first issue of the Italian Fotosub magazine, published in 1977; look, it is an artistic cover, thats why I want it! Special foldout plastic cover bound, 430 pages, hundreds of mono photographs, index, bibliography, text and captions in Italian and English. Sorry, no longer available from us. THE HISTORY OF OILFIELD DIVING - An Industrial Adventure. Christopher Swann. What a superb book, exceptionally well researched and fascinating to read. The original oilfield divers demonstrated exceptional courage, which remains a requirement to this day. Author Christopher Swann knows his subject as a saturation diver himself. The History of Oilfield Diving chronicles one of the greatest adventures of the 20th Century. A story of human endeavour, physical danger and breakneck technological development, this is the most comprehensive account of oilfield diving ever written. Until the 1950s there was no oilfield diving industry. The few men who dived for a living fished for abalone or plied their trade in harbours and dockyards, on civil engineering projects and on the occasional salvage project. Nearly all the work was in shallow water. As a result, there was little innovation in either equipment or techniques. As oil was found at greater depths, all that changed. In the early 1960s, the oil companies drilling off the coast of California were pushing the limits of traditional commercial diving. All their exploratory wells were in 200-250 feet of water, a depth at which nitrogen narcosis becomes a serious limitation. Progress into still deeper water was about to come to a halt.Until, that is, a former US Marine, who made a precariouss living diving for abalone, mounted a scuba regulator in an abalone helmet, bought some helium from a hospital supply company and dived - to 400 feet. Oilfield diving was about to take off. Hardcover, dustjacket, 845 pages, many many money photographs, several colour plates, index, appendicies, maps, bibliography for each chapter. $155.00. Sorry, no longer available. Now scarce. DEEP, DEEPER, DEEPEST. Man’s Exploration of the Sea. If anyone can write a book on ‘Man’s Exploration of theSea’ it is Robert Marx. His treasure and archaeological finds are quiteamazing, and with fifteen books to his credit, he is well versed to writethis book. His style is easy and interesting and the photographs are adequateto complement the text. He starts of with free diving, then goes into theearly diving bells, diving machines and helmet diving. Armoured divingsuits get a mention, and of course the modern scuba equipment. Additionalchapter cover warfare, submersibles, underwater habitats, underwater archaeology,sunken treasure, and oceanography. A very good read - interesting and informative. DIVING PIONEERS - An Oral History of Diving in America. Sorry, no longer available from us.Try Best publications. The author is well known for his many well researchedand fascinating articles on diving history that appear regularly in thediving magazines, as well as his book ‘Niagara's Gold'. The first thingI checked out was to see if there was any mention of Noel and Kitty Monkman- and there was, indeed a very good tribute to these pioneer Australianfilm-makers. The seven major chapters cover: The Standard Dress Divers,The Pearl Divers, The Inventors, The Salvage Divers, Divers at Work, TheNavy Divers, The Scuba Divers. Thus the book covers commercial and militaryoperations, police, pearl and navy divers, and the introduction of recreationalscuba into Autralia. A great read, educational and entertaining. And didyou know - the single-hose regulator, now used by divers worldwide, wasinvented in Melbourne? Containing the Submarine Exploits of J.B.Green the Celebrated Submarine Diver. Faxton's Steam Power Press, Buffalo, USA, 1859. Reproduction by Atlantic Diving Equip. Co. Inc.1990. Softcover, saddle stiched, 84 pages, mono drawings. HISTORY OF SPEARFISHING AND SCUBA DIVING IN AUSTRALIA. (The First 80 years 1917 to 1997). This was certainly worth waiting for. It is unusuallypresented in that it departs from the normal continuous text concept andrelies instead on hundreds of newspaper-style headings and stories, someindeed condensed directly from newspaper and magazine articles. It is thereforeand eminently readable book as you can skip from article to article asthe interest warrants - from death to treasure, failures and achievements,early equipment and technique, and the pioneers of our sport. A most valuablebook and a must for all divers. Sorry, no longer available from us.May still be in print. MAN AND THE UNDERWATER WORLD. Pierre de Latil and Jean Rivoire. Translated from the French by Edward Fitzgerald. Jarrolds, London. In my humble opinion, this is the best book written on the development of diving from the early ancient myths of the Greek Gods to the development of scuba, and submersible exploration. A brilliant book, a most significant contribution to our knowledge of the underwater world, superbly researed and written. Of great historical value for its content and being relatively rare. Hardcover, dust jacket, 400 pages, mono prints throughout. Second hand. We occasionally have a second-hand copy: price range to $100. Pierre de Latil and Jean Rivoire. Translated from the French by Edward Fitzgerald. First USA edition, 1956; G.P. Purnam's Sons, New York (brown jacket). Hardcover, dustjacket, 400 pages, index, a few mono drawings. In my humble opinion, this is the best book written on the development of diving from the early ancient myths of the Greek Gods to the development of scuba, and submersible exploration. A brilliant book, a most significant contribution to our knowledge of the underwater world, superbly researched and written. Of great historical value for its content and being relatively rare, the book itself is a collector's item. What Ceram did for archeology in Gods, Graves and Scholars, and Herrmann for ecology in Conquest by Man, two brilliant young French authors have done here for the fascinating story of man's endeavors to explore the three quarters of the earth's surface that lies beneath the sea. Truly it constitutes a second universe, which still holds untold secrets and resources. From the earliest times man has sought to penetrate this vast and mysterious realm by various means, but only recently has undersea exploration begun to achieve its real goals. The year 1953, which saw the conquest of the land-surface completed by the ascent of Everest, also saw the conquest of the deep furthered by successful descents to previously unknown depths by bathyscaphe, and the plumbing by oceanographers of the ultimate abysses, which demonstrated that life exists even there. Latil and Rivoire, in a style admirably concise, present all the principal episodes in this long and often heroic history. Greek and Roman divers, the schemes of Leonardo and others in the Middle Ages, the progress of undersea warfare in which the American Fulton played an important part, Jules Verne and his fantasies, some of which were carried out by Beebe and other later explorers, down to the sportsmen, photographers, and skin-divers of today—all are included in this informative, accurate, and readable book. The present enthusiasm for underwater activities of all kinds lends a particular value to this historical survey, but even without it this volume would take its place as a classic in its field. The many well-selected illustrations add considerably to the book's attractions. (Issued to Seamen Gunners in the US Navy). This is a wonderful reprint of a most historic and fascinatingmanual. The seven chapters include ‘requirements for divers', ‘ descriptionof diving apparatus', accidents', ‘rules for resuscitation' (do not standthe diver on his head), ‘signals', ‘preparation and care of equipment',‘pressure at depth'. A wonderful, remarkable book, so much to read. An historic collection of material from the A. Schrader Diving Equipment Co. Of New York, manufactures of diving helmets. The collection consists of several items, provided in clear plastic protective sheets A4 size in a four-ring D binder. * An 8-page A4 size history of August Schrader and his company. * An 8-page A4 size full colour booklet of Schrder and Craftswell Equipment Corp helmets. Within the collection you will find a complete set of 10 MkV drawings; Helium Hat; 1916 Schrader MkV Prototype photo and drawing; 1898, 1912 and 1917 Schrader Knives; Early Schrader Air Pumps; Many Schrader helmets from 1898 to 1941 including 4 & 5 bolt helmets. Sorry, no longer available. Well out of print. Have not been able to contact publisher. SHIPS BENEATH THE SEA - A HISTORY OF SUBMARINES AND SUBMERSIBLES. British edition published in 1975 by Robert Hale and Company. The best book I have found on the subject, concisely written, factual and interesting. Introduces Dr. Cornelius Van Drebbel, one of the inventors of the submarine in the seventeenth century; the Eagle and the Turtle of the eighteenth century, and later developments of submarine and submersibles. Hardcover, dust jacket, 260 pages, many mono photographs. Illustrated with over 100 photographs and diagrams, this book gives the complete history of the underwater conveyance. Ships Beneath the Sea tells the adventurous story of how a man has challenged the depths. It is a popular history of submarines and submersibles, spanning the centuries from the earliest crude conception in the 13005 to our most sophisticated scientific achievements today. The author shows in fascinating detail the evolution of the first underwater vessel in 1578 into such vessels as the diving bell, the bathysphere, the bathyscaphe and the submarine. He also deals with the many functions of underwater vessels: travel, sea warfare, and scientific research into the geology of the ocean bed. Robert Burgess highlights the personalities and careers of such inventors as Auguste and Jacques Piccard and Jacques Cousteau with an excitement that he communicates to the reader. Sorry, no longer available from us. Try Best publications. Who are our underwater heroes? Cousteau and Hass comereadily to mind, and to the historically educated, no doubt Gagnan, Dumasand Taillez, Siebe and Davis, Rouquayrol and Denayrouze But what of theman who gave Hans Hass his first lessons in diving, Guy Gilpatrick, orthe incredible naturalists Henri Edwards and Roy Miner, the depth-defyingCharles William Beebe, or the remarkable English marine biologist and educatorJack Alwyne Kitching? These were truly remarkable pioneers of diving, settingstandards and procedures for divers to follow, opening the underwater worldto the closed minds of the university academics who could not comprehendwhat they could not see. Of Haldane, father and son, we, perhaps, knowa little, for they set the standards for breathing air at high pressuresresulting in the development of decompression tables, and the use of ahelium-oxygen breathing mix. That it should have become a best-sellerand acclaimed by all who read it, Stars Beneath the Sea owes its appealnot only in its remarkable subject matter but more so on the succinct andeloquent style of the author, peppered with humour and anecdote. I foundit to be one of the most rewarding books on diving I have ever read, providingrelaxed entertainment with a wealth of knowledge - a most remarkable book. Now out of print. Hard and softcopy occasionally available. Enquire. Now have one hard $35.00, and one soft $25.00 copy available. THE AMERICAN DIVE CATALOG COLLECTION. E.J. Willis Co. (distributor of the Snead Shallow water helmets and air pump). Hard cover with leatherette finish, A4 size, limited to 1500 un-numbered copies. Sorry no longer available. Have been unable to contact publisher. Captain J.Y. Cousteau with Frederic Dumas. me. Perhaps its because he is just so damned skinny!!! There is nothing about the historic development of scuba (is Gagnan even mentioned? ), centering rather on the diving exploits of the French Navy's Underwater Research Group and the Calypso. It is however an important work as it was perhaps the first ‘popular' book to bring attention of the general public to the underwater world. Hardcover, dust jacket, 148 pages, mono plates throughout, sixteen colour plates (from National Geographic). Second hand only. Well out of print. We do have copies in stock in various condition. Contact us - about $20-$40, some with an original dust jacket or computer generated jacket facsimile.